Volkswagen will launch their T6 in late 2015 in Australia and Renault has shown off with their new models of the SWB and LWB version of the Trafic. Reimo is developing the new European style roofs for them and the first T6 Reimo roof will be available from November 2015 onwards. 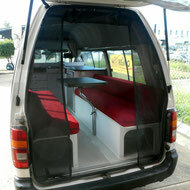 So if you considering to order a new T6 or Trafic- talk to us for your roof conversion options and pricing. Margaret and I recently put a deposit down on a new Renault Trafic LWB. We were told it would be ready for pi k up January or February. We are now looking seriously at who will do the conversion for us. Thought we'd touch base with you.